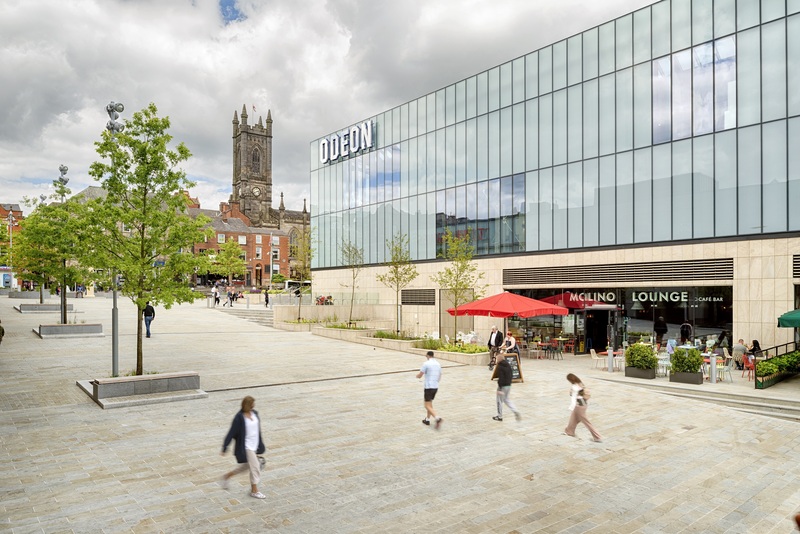 As part of a £32.5m project to regenerate Oldham’s Grade II listed Old Town Hall, BDP was appointed to ensure certain architectural features were retained during the redevelopment, whilst allowing the building a new use by incorporating cinema screens and leisure facilities. A new extension has also been added to the building in the form of a translucent light-box giving a new entrance and foyer to the cinema and shopping areas. 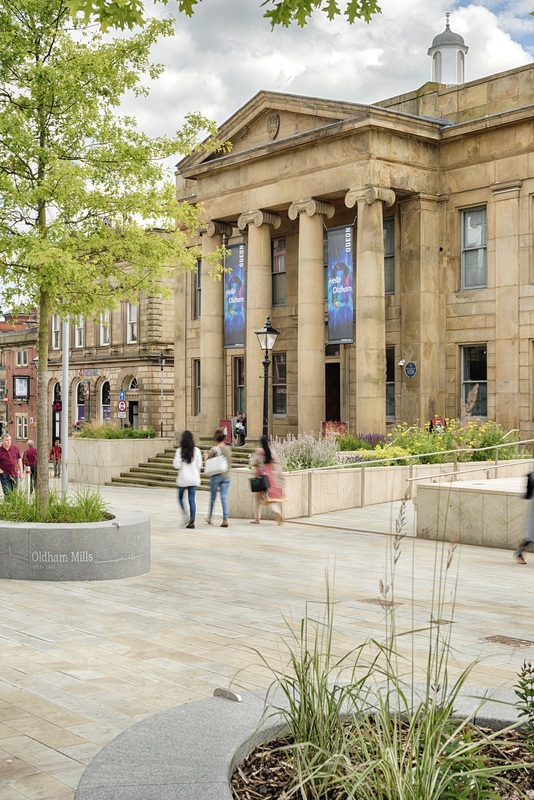 Externally, the surround of the Town Hall has been transformed into a pedestrianised square housing planters and seating to enable social interaction within the space. 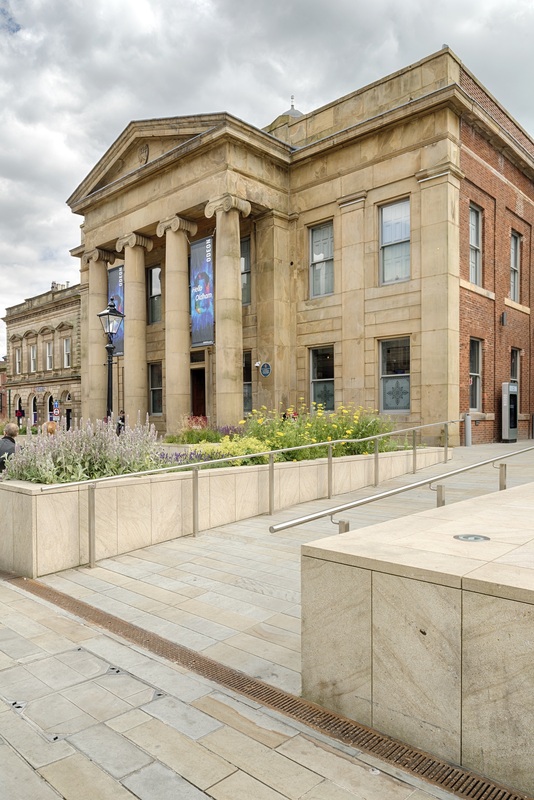 The hard landscaping on the scheme was selected to coordinate with the existing colour tones and heritage of the original Town Hall building, while the new natural stone planters and seating areas were chosen to contrast and pick out elements of the more modern extension. 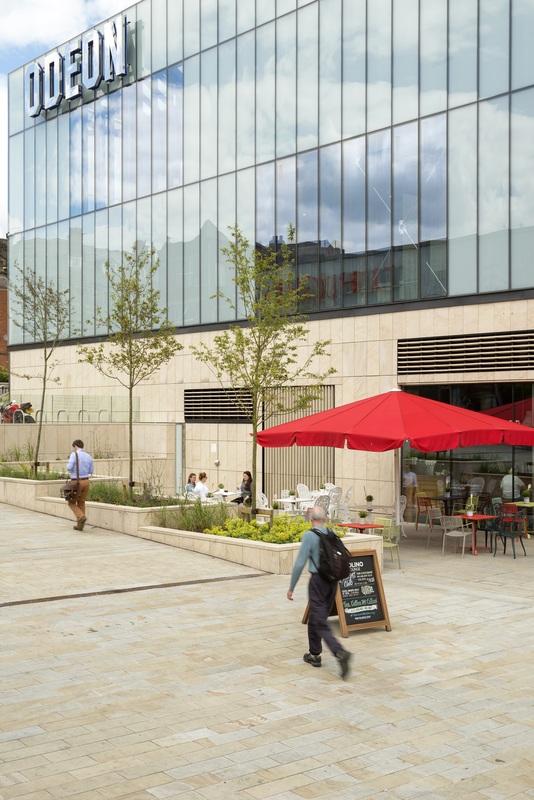 Marshalls was selected to supply Scoutmoor Yorkstone Natural Stone Paving, which is quarried less than 15 miles from the project, and used throughout the town across the Oldham Metrolink project. Together with flags units, Marshalls also supplied a mixture of setts, tactile units, steps and cladded planters in Scoutmoor Yorkstone facilitating a cohesive external landscape in the space. 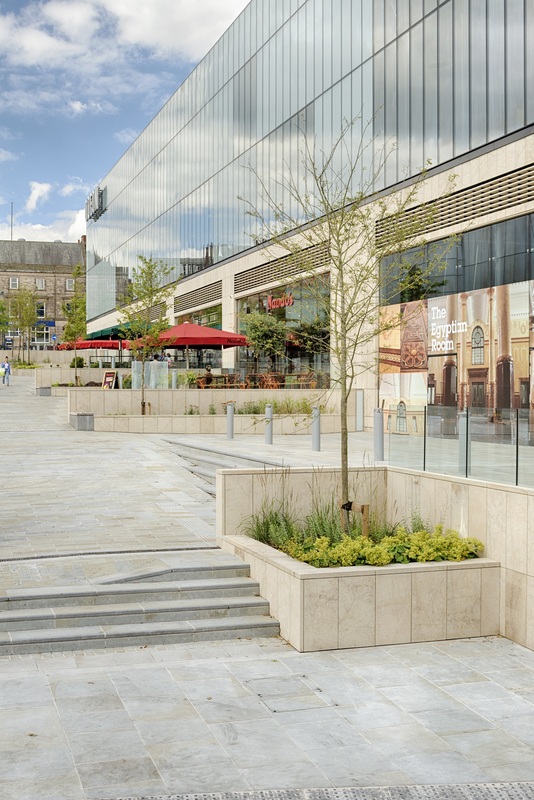 Marshalls also supplied bespoke Prospero Granite planters and seating which were jet cut with detailing representing the textile trade in the local area. Intricate artwork was sandblasted into the surface of the planters, and then painted to give the detail a more prominent finish. A number of yorkstone flags were also inlaid with bronze detailing to give the scheme a premium finish. Scoutmoor natural stone is the strongest Yorkstone in the UK and is widely used throughout London because of its high strength and excellent slip resistance. 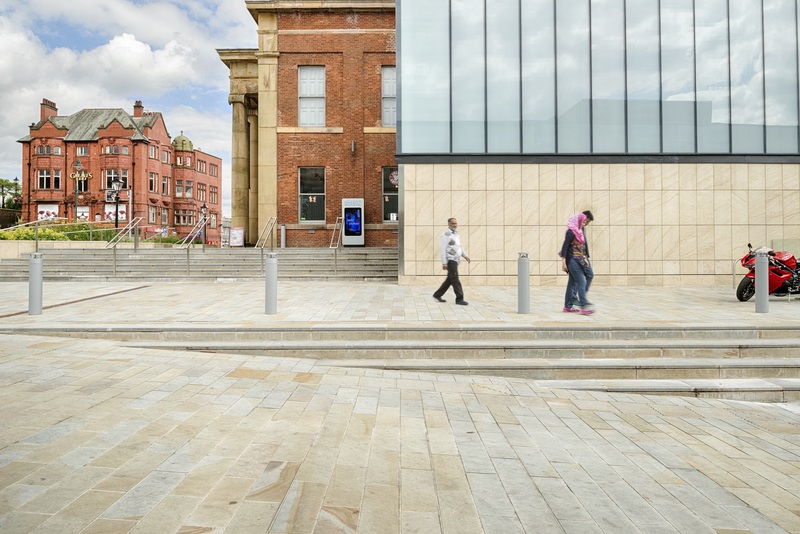 The extremely durable stone is suitable for both pedestrian and trafficked areas making it the perfect solution for Oldham Town Hall.